Eliminating malaria from a defined region involves draining the endemic parasite reservoir and minimizing local malaria transmission around imported malaria infections. In the last phases of malaria elimination, as universal interventions reap diminishing marginal returns, national resources must become increasingly devoted to identifying where residual transmission is occurring. 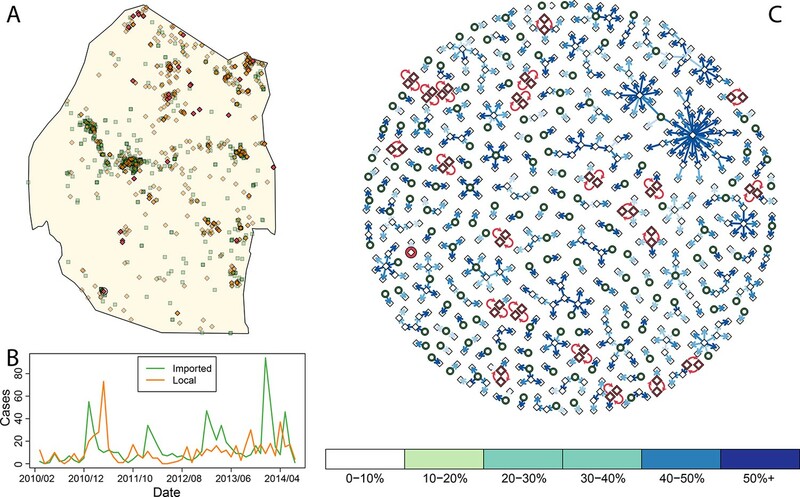 The needs for accurate measures of progress and practical advice about how to allocate scarce resources require new analytical methods to quantify fine-grained heterogeneity in malaria risk. Using routine national surveillance data from Swaziland (a sub-Saharan country on the verge of elimination), we estimated individual reproductive numbers. Fine-grained maps of reproductive numbers and local malaria importation rates were combined to show ‘malariogenic potential’, a first for malaria elimination. As countries approach elimination, these individual-based measures of transmission risk provide meaningful metrics for planning programmatic responses and prioritizing areas where interventions will contribute most to malaria elimination. Swaziland has set a national goal of eliminating malaria transmission in the very short term, which would make it the first country in sub-Saharan Africa to do so. More than half of the cases of malaria that are observed in Swaziland are caused by infections picked up by travelers while they were in other countries where the disease is much more prevalent. The other cases – people who became infected in Swaziland – are the cases that the government of Swaziland is trying to prevent. If Swaziland is going to eliminate malaria, it will need to identify any places where the malaria parasites are still spreading throughout the population so it can target those communities with effective prevention measures. It will also need to manage the risk that infections imported from abroad may re-start transmission in places where it has been stopped. To work out how likely it is that a malaria infection will be transmitted by mosquitoes in a particular place, researchers can look at past malaria data and calculate how many new infections are caused by each case. Reiner et al. have now produced a computer model that estimates how this number varies across Swaziland, highlighting places where the government is going to need to focus efforts to eliminate malaria. The model shows that in some rural areas near Mozambique, each individual infected with malaria is causing more than one other person to become infected. This confirms that the disease has not yet been eliminated from these areas. However, in other regions of the country, malaria rarely spreads between individuals. The detailed regional information from the model may help public health authorities in Swaziland better target their anti-malaria resources. In large cities where most cases are imported, Reiner et al. suggest focusing resources on providing preventive treatment to travelers who plan on visiting places where malaria is spreading. However, in rural areas where malaria continues to spread, preventively treating the whole population or providing them with tools to protect them from mosquitoes might be more appropriate. Similar considerations of regional differences in the spread of malaria could also help other countries to more effectively combat the disease. Malaria is a leading cause of childhood morbidity and mortality (Naghavi, 2015), and chronic malaria infections contribute to and complicate diagnosis and treatment of other diseases. Controlling malaria to reduce its burden has long been a top global health priority, and eradication became an official policy of the United Nations in 1955 (Mayo and Brady, 1955). The ensuing Global Malaria Eradication Campaign (GMEP, 1955–1969), directed by the World Health Organization, contributed to a massive, permanent contraction in the geographic range of malaria (Gramiccia et al., 1988; Smith, 2013), and it led to development of concepts and methods for eliminating malaria that remain useful today. A key insight was the need to use different metrics, suited to natural constraints and programmatic needs, to mark progression from endemic malaria to elimination (Hay et al., 2008). Malaria eradication is once again recognized as a global priority, and as of 2011, 36 of 99 malaria endemic countries had plans to eliminate malaria (Cotter, 2011). Concepts and methodologies developed for the GMEP are being revisited and updated today in light of contemporary challenges and new technologies. Three useful concepts were called vulnerability (i.e., the rate of malaria importation), receptivity (i.e., the potential for ongoing local transmission), and their product, which was called malariogenic potential (i.e., the expected number of cases that could occur as a result of vulnerability and receptivity) (Pampana, 1969). Given that GMEP was predicated on the idea of universal insecticide spraying throughout at-risk areas, these notions were used primarily to evaluate the vigilance required to prevent reestablishment of transmission post-elimination rather than to make decisions about intervention selection or targeting (World Health Organization, 2012). They thus require updating in light of the different assumptions of the present campaigns. Malaria importation rates for African malaria elimination countries are much higher than those for countries that eliminated malaria in past decades due to high mobility and highly endemic neighbors (Tatem, 2010), and receptivity may be greater. Countries have multiple tools at their disposal but must determine how to deploy them optimally to achieve and sustain elimination given constrained resources. These challenges are now being faced by Swaziland, a sub-Saharan country that has made substantial progress towards eliminating malaria. Success would make it the first mainland sub-Saharan country to eliminate malaria, and so the lessons from its national experience will be relevant for the rest of the continent. A key need is for new quantitative methods and practical operational advice to guide the final stages of malaria elimination, when few local cases remain. Elimination programs have repeatedly demonstrated the critical importance of identifying areas where transmission continues in order to make the most of limited resources. The architects of the smallpox eradication strategy, for example, credit the campaign’s ultimate success to a shift from universal to targeted vaccination (Foege et al., 1971). Successful elimination of malaria during the GMEP similarly demonstrated that, in resource-constrained environments, a shift is required away from a focus on universal coverage for endemic malaria towards heightened surveillance, case investigation, identification of areas where transmission risk remains high (i.e., residual transmission foci), and highly targeted interventions (Moonen, 2010). Despite progress (Ja and Hg, 2009), little guidance is available on what specific methods to use where and which metrics are appropriate for measuring progress in today's eliminating countries. Since 1999, Swaziland’s National Malaria Control Program reports that the incidence of malaria has declined from 2.9 to 0.07 malaria cases per 1,000 people per year (Roll Back Malaria, 2012). Between 2010 and June 2014, Swaziland confirmed only 2,129 malaria cases, with case investigation of 1,524 of them. Of these, 870 (57%) were classified as imported, with the proportion of cases likely having acquired their infection elsewhere increasing since 2010. At a national level, the decreasing ratio of local to imported malaria cases since 2010 is suggestive of an reproductive number under control, Rc, much less than 1 on average, which would mean that elimination of endemic transmission may have already been achieved or is imminent (Churcher et al., 2014). Analysis of national trends in reporting data provides a useful measure of overall progress but potentially masks local spatial heterogeneity in transmission, and it leaves unanswered the question of how to stratify Swaziland to allocate resources most efficiently within the country. Ideally, programs would focus attention on places and at times where and when the risk of malaria transmission is highest. Programs might direct aggressive interventions, such as focal mass drug administration, towards residual endemic foci where transmission would persist even in the absence of importation, but might opt for less aggressive maintenance of reduced risk in places where transmission is driven only by continual replenishment from imported infections. Determining whether locally acquired malaria infections are the result of endemic transmission or result from transmission chains stemming from importation requires analyzing transmission at an individual level. 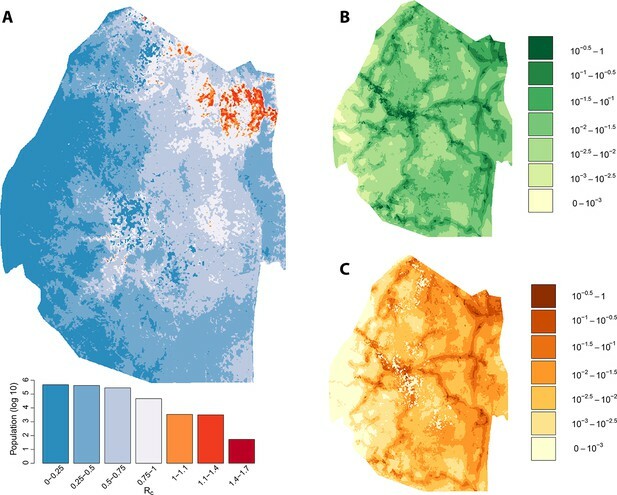 National risk maps have been developed based on the household locations of local malaria cases (Cohen, 2013) but these maps do not describe how much transmission is likely occurring, only whether or not there is risk of any local infections in a given location as narrowly defined by the location of infected individuals. Furthermore, they do not explain the relative importance of importation as a driver of transmission and thus cannot inform intervention selection. Improving assessment of progress and making action maps requires developing individual-based assessment of risk to link cases together, determine the magnitude of transmission as measured by RC, and evaluate where transmission may be occurring endemically versus where it is driven only by ongoing importation. Most of the imported cases have been identified in and around the large cities of Mbabane and Manzini (Figure 1A), but proportionally fewer locally acquired cases were found in these cities (Cohen, 2013). Malaria cases imported into the major cities of Swaziland are likely only responsible for causing a few local cases (i.e., Rc in the large cities is very low). Areas outside the major cities—specifically those in the east and north of Swaziland—appear to have a higher ratio of local to imported cases, suggesting that though on average each malaria case generates less than one other case (i.e. Rc < 1), there are some focal areas where endemic transmission may continue to smolder. Measuring progress and achieving elimination requires properly characterizing and quantifying heterogeneity in this residual transmission. Here, to address these needs, we have defined vulnerability, receptivity, and malariogenic potential in quantitative terms based on a continuous point-process and developed fine-grained maps. Consensus network plot of causal links. Panel A: Swaziland imported and local malaria cases (green squares and orange diamonds, respectively) are plotted spatially. Local case pairs identified as putative orphaned chains are indicated by red diamonds. A solitary local case also identified as an orphan is identified as a red diamond within a circle. Panel B: Swaziland imported (green line) and local (orange line) malaria cases are plotted in time, aggregated by month. Panel C: The final consensus network plot is displayed. Local cases are plotted as diamonds and imported cases as green circles. The color of each link corresponds to the “strength” of the connection as measured by the number of parameter sets where that link was identified as optimal. Imported cases that were not found to be the “most likely” parent of a local case are not displayed. Taking the output of the transmission network, the number of direct ‘offspring’ arising from each case is its estimated Rc. 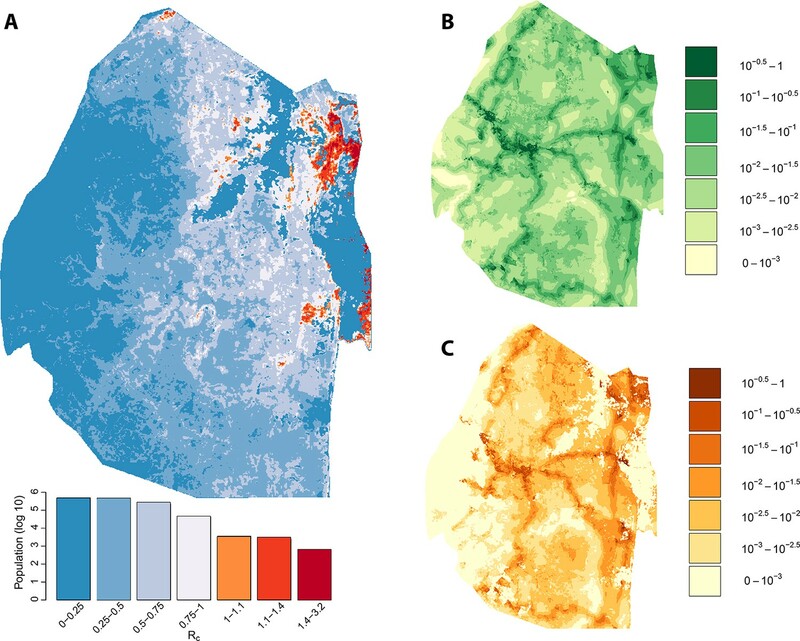 Using zero-inflated negative binomial regression models on a set of ecological, social and demographic covariates, likely values of Rc were extrapolated spatially from observed case locations to all of Swaziland at 100-meters squared resolution (Figure 2A). The resulting map of Rc illustrates the estimated heterogeneous distribution of current malaria receptivity within Swaziland. To the west, Rc is close to 0. Within Mbabane and Manzini, Rc is estimated at 0.08 and 0.12 respectively. Conversely, in the northeast near the Mozambican border, Rc estimates increase up to 1.70. As suspected, while endemic transmission does not appear to occur within the urban centers of Swaziland, it does not yet appear eliminated from the entirety of the country. 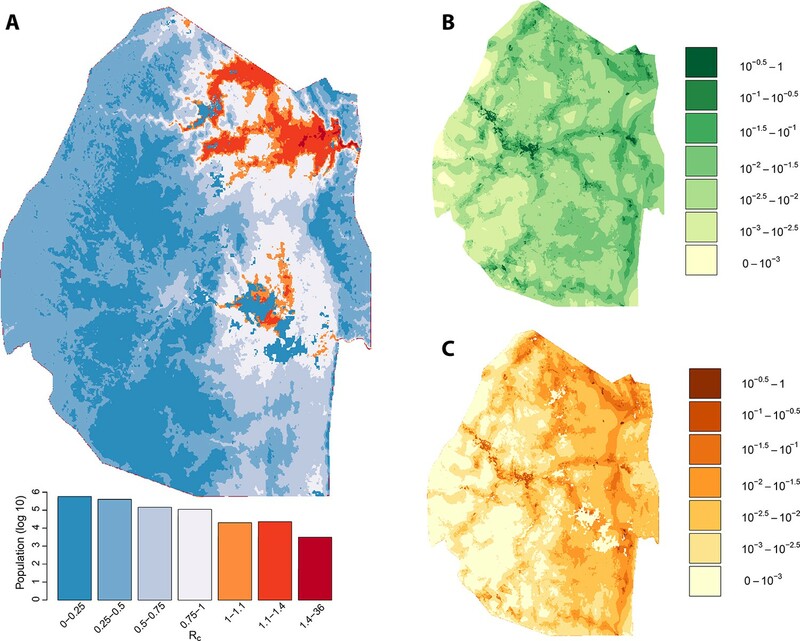 The smoothed Rc map was found to be statistically significantly different from a flat map (p-value <2e-16) but it remained unclear the statistical significance of each pixel. Further analysis is required to assess the robustness of isolated locations where Rc appears elevated. This will be an important step to appropriately interpret these maps for the purpose of resource allocation given constraints on the number of individual locations that can be visited. Vulnerability, receptivity and malariogenic potential. Panel A: Extrapolated Rc values for Swaziland using a zero-inflated negative binomial regression. Areas in orange to red indicate locations where Rc is greater than unity. The legend doubles as a histogram indicating the number of individuals (on a log10 scale) that live within each range of Rc values. Panel B: Extrapolated importation probabilities for Swaziland using a logistic regression. Panel C: Malariogenic potential for Swaziland calculated as the product of Rc and the probability of importation. The potential for local transmission will not result in actual transmission unless malaria parasites are present. As Swaziland successfully extirpates these final foci of endemic transmission, local transmission in the country will increasingly arise only around imported malaria cases. The total number of locally acquired malaria cases in Swaziland is the product of importation (vulnerability) and onward transmission (receptivity), with the ongoing operational challenge of maintaining gains greatest in regions with both higher receptivity (i.e. RC) and higher vulnerability (i.e., the number of malaria infections imported each year that could seed new transmission): the product of these quantities has been defined as the ‘malariogenic potential’ (Pampana, 1969). Malariogenic potential was mapped as the product of Rc and vulnerability (Figure 2c). The resulting map illustrates where locally acquired/transmitted cases are most likely to occur, and thus where resources may need to be prioritized to prevent reestablishment of malaria given the joint risks of importation and subsequent transmission. We assessed the stability of our malariogenic potential maps as well as our other output by splitting the data into two halves (before and after July 1, 2012). The malariogenic potential maps for the two halves appear very similar (Figure 3C versus Figure 4C), as are the importation maps (Figure 3B versus 4B). There are some differences in the Rc maps (Figure 3A versus 4A), but both analyses identified regions in the northeast where Rc was larger than 1. Both analyses identified a larger ‘max’ Rc (35.36 for the first half and 3.13 for the second half) as well as a larger percent of the population living in the highest Rc category (Rc>1.4). Vulnerability, receptivity and malariogenic potential (2010-6/2012). Vulnerability, receptivity and malariogenic potential (7/2012-2014). Ideally, every case of malaria in Swaziland would be detected. In reality, case detection is imperfect, and it is likely unnecessary to find every case to create circumstances that lead to elimination. In this analysis, missed cases could matter if they biased the estimates of Rc, depending on whether locally transmitted or imported cases were more likely to be missed. If a case that is missed results in local transmission and if those future cases are captured by surveillance, those future cases may appear to have no plausible cause. The identification of such “orphan” cases can help indicate places where Swaziland must work to implement or strengthen active infection detection. Within this analysis, due to the inclusion of temporal uncertainty to account for potential differences between detection times and time of onset, rare links can be formed between a case and a second case where the second case was picked up at the same time or even later. These rare links would only form if no other case that occurred earlier were close in space-time as judged by the spatio-temporal kernels. In these circumstances, due to the flexibility of the spatio-temporal kernel, a pair of cases could be identified as being the most likely parent of each other. These “loops” identify two orphaned cases that were identified close in time-space to each other but whose actual parent was not captured by surveillance. Within this analysis, there were 22 pairs of local cases that formed loops (Figure 1A, Figure 1C, red diamonds) as well as a single case that was not linked to any other case across any of the potential parameter sets (Figure 1A, circled red diamond, Figure 1C, red circle). Prioritizing enhanced surveillance in the areas surrounding these orphan chains would help narrow uncertainty about residual transmission within Swaziland. The majority of these loops occurred during the months with the least transmission (Figure 5), which reflects the decreased chance of any cases being detected in the month prior. The method described here yields estimates of transmissibility that can guide interventions to places where occult transmission is most likely to be happening even in the absence of knowledge of specific infected individuals. Nevertheless, the more complete the surveillance effort, the more accurate these mapping efforts will become. The average number of cases per month and total occurrence of looped (or ‘orphaned’ cases) are plotted against month. Asymptomatic infections are another possible explanation for the orphaned cases. Missing asymptomatic cases could either result in an overestimate or underestimate of Rc (if they are likely parents or likely offspring of other cases). For this analysis, we did not account for asymptomatic or inapparent cases. Although it was not done universally, intensive infection detection around cases resulted in very few additional infections (53/7307 between July 2014 and June 2015) consistent with the assumption that there is not a large pool of unreported infections that would greatly bias our results. Communicable disease policies require different approaches than policies for non-communicable diseases, as each case presents both medical and public health challenges (Smith et al., 2005). For infectious diseases, reproductive numbers provide a theoretical basis for strategic planning and programmatic evaluation, such as critical vaccine coverage levels and outbreak responses (Anderson and May, 1991). Estimating individual reproductive numbers by linking up malaria infections is a special case of a method that has be used more widely for other diseases (Walker et al., 2010). Malaria, like other diseases with an environmental component, represents a special challenge because of spatial heterogeneity in the risk of transmission (Bejon et al., 2010; Bousema et al., 2012; Bejon et al., 2014; Bousema et al., 2010). In the end phases of elimination, population-level measures become inefficient and inadequate, so as countries approach the goal of eliminating malaria, individual-based estimates of transmission must identify putative foci where transmission remains high and where resources should be targeted (Hay et al., 2008). Case counts alone do not necessarily convey information about transmission, since many of those cases may have been acquired far from where they were detected. Aggregate ratios of local to imported cases in time (or in space) alone, while more representative of overall progress, could obscure localized transmission if, for example, most cases failed to transmit but some pockets of transmission remained. This analysis, which identifies places and times where cases are most likely to be transmitted, confirms that there has been dramatic progress towards elimination overall, but it also identified substantial heterogeneity in progress within Swaziland. The Swaziland National Malaria Control Program (NMCP) will need to manage imported malaria as long as endemic transmission continues in neighboring countries, so directing and optimizing limited resources is crucial. Combining assessments of receptivity with assessments of vulnerability provide actionable intelligence to support malaria programs in designing targeted intervention strategies in the most relevant places; for example, the NMCP may consider targeting travelers with prophylaxis in places with high vulnerability, while focal mass drug administration or other aggressive measures might be most appropriate in places with evidence of endemic transmission and low vulnerability. Our approach provides spatiotemporally relevant and resolved metrics of transmission that can be used to identify future cases as either critical or relatively unimportant for overall elimination efforts. Further, and perhaps most important, our approach can be used to stratify future control responses by differentiating between locations where elimination would be a consequence of merely decreasing effective importation versus where elimination of endemic transmission is needed through reduction in local receptivity. Predictions generated by our approach will also be useful as a baseline for in-development genetic testing and molecular typing models (Greenhouse and Smith, 2015), and will remain pertinent as a proxy for such methods in places where resources are limited to enable universal parasite typing. These methods can help Swaziland reassess its needs and remain malaria-free as surrounding countries control transmission and make further progress. Through regional elimination, economic growth, and efficient use of existing resources, malaria elimination can perhaps become as stable in Swaziland as it has been elsewhere (Smith, 2013; Chiyaka et al., 2013). Swaziland implemented the first stage of a national malaria elimination policy in 2011, and local malaria transmission dropped to extremely low levels. There was a 25-fold decline in the average malaria case-load, from 10.0 cases per 1000 in 1995 at the peak of an epidemic to 0.4 cases per 1000 in 2010 (Roll Back Malaria, 2012). Swaziland also benefitted from a regional malaria control effort called the Lubombo Spatial Development Initiative (LSDI) established as a partnership with neighboring countries. The LSDI sharply reduced the number of malaria cases imported from its neighbors, and now most of the remaining cases appear to originate in Mozambique. At low transmission intensity, the methods and metrics used elsewhere in Africa to assess the risk of further local transmission initiated from imported malaria become inadequate, so Swaziland adopted a surveillance system based on some combination of passive and reactive case detection. Household locations of confirmed malaria cases were identified by passive or reactive case detection and georeferenced by the NMCP. Infected individuals reporting no travel, whether abroad or within Swaziland were categorized as locally acquired cases. Infected individuals who reported travel abroad to endemic countries within biologically meaningful windows were categorized as imported cases. Initially, a travel history in the previous two weeks was collected, this was updated to four weeks in August 2012 and to eight weeks in July 2013. From January 2010 to June 2014, Swaziland investigated 1,524 cases collecting information about household location, case demographics (age, gender, occupation), use of malaria prevention measures, dates of symptoms and of diagnosis, treatment. Of all investigated cases, 592 (38.8%) were categorized as locally-acquired based on a lack of a recent travel history to endemic regions. This national average of 592 local cases to 870 imported cases suggests that on average, the reproductive number under present levels of control is approximately 0.4. This estimate represents a national average figure, however, and it could disguise undetected ongoing transmission in some hotspots. What is needed is a tool that can simultaneously assess transmission dynamics in a low-transmission setting such as Swaziland, identify locations that systematically produce unobserved cases, and provide internal feedback to improve the surveillance system. As a first step towards accomplishing this larger purpose, we developed algorithms to reconstruct putative transmission chains. Using comprehensive case data from the Swaziland NMCP from 2010 through 2013, these estimated chains—based on identifying likely causal links between successive cases through the use of spatio-temporal kernels—provide insight on the frequency and length of chains of local transmission. To evaluate the relative chance that one locally acquired case arose from any other case, we would optimally like to calculate the probability that an older case was fed on and initiated a transmission cycle in a mosquito that subsequently fed on and infected the second case. This measure of propensity would combine the epidemiology of malaria within a mosquito, the mosquito’s lifespan as well as movement probabilities for both mosquitoes and humans. Given the complexities of both human and mosquito movement, we assessed the likelihood using a family of probability distribution functions. By varying the unknown space and time parameters for each component, we can produce a putative single space-time distribution of locally acquired cases based on the time and location of any other case. The mosquito and transmission dynamics component is more complex. Due to the disease ecology of malaria, incubation periods within both the mosquito (known as the extrinsic incubation period) and the second host (known as the intrinsic incubation period) definitionally separate onset of infectiousness in secondary infections from the onset of infectiousness in the initial case (the time between the onset of infectiousness in causally linked infections is known as the serial interval). The serial interval is the sum of the extrinsic incubation period, the time elapsed while infectious mosquitoes quest for blood and infect humans and the intrinsic incubation period. We estimate the intrinsic incubation period as minimally 18 days (approximately six days in the liver plus 12 days for mature gametocytes to be produced in sufficient densities) and the extrinsic incubation period as minimally 12 days. Note that there is zero chance that the serial interval is less than the sum of the two incubation periods. Also, when t≥30, the effect of mosquito mortality does not apply to the portion of the serial interval attributed to the intrinsic incubation period. Thus, with the exception of D and σt, the entire spatio-temporal distribution of transmission is specified. Since both the movements of mosquitoes and humans is encapsulated by D, it is unclear exactly what its value should be. However, as will be discussed below, by sweeping across a variety of values, we can actually use the uncertainty in D to understand which links are relatively strong and which are relatively tenuous. Similarly, the true difference between onset and detection is unknown and we will likewise sweep across potential values of σt. The model described above computes the likelihood that a mosquito infected by a putative index case at a particular point in space and time later infected an individual identified as a locally acquired case at a different point in space and time. The assumption that movement can be approximated by diffusion (and the use within the `likelihood’ of the exact locations where the two cases were identified) will necessarily force the computed chance of causal infection to be extremely low. As such, any probability computed using the above spatio-temporal distribution would often yield inappropriately low values—if only because every particular place and time was unlikely. What is more useful, given the uncertainty, is to compare likelihood measures. All locally acquired cases can be assigned to a “parent” that gives the highest likelihood, even though it may be only marginally more likely than some other link. We assume due to the extremely low transmission intensity of malaria in Swaziland that each infection was only caused by a single parent and superinfection did not occur. A threshold value was chosen and tested to help identify cases that were “orphans,” or unlikely to be associated with any other identified case. The most likely parent or orphan status was computed for each combination of a mesh on the constants (i.e., D, σt and a threshold value). The aggregate data from all these assessments was used to estimate the strength of some particular connection. Links that only occur in the rarest of cases (i.e. when the diffusion constant is extremely high) are tenuous. For the Swaziland data, we compute the set of potential links for 400 different scenarios corresponding to 20 different values of the diffusion constant and 20 different values of σt. We vary D in even steps from 40 m to 1000 m and vary σt from 0 to 19 days. For display purposes we will indicate the link that occurred the most times, although in most cases the link that occurred the most frequently was the only potential link identified for a given case. Further, we vary the relative probability threshold from 1% to 50%, also investigating the intermediary value of 10%. The number of direct offspring at each case location was explained by a set of spatial covariates, which described weather, geography, population density, and urbanicity (Figure 6). Elevation and topography have been demonstrated to influence risk through their effects on temperature and suitability for mosquito breeding (Cohen, 2008). The topographic wetness index (TWI), a measure representing the amount of water that should enter a given spatial unit divided by the rate at which the water should flow out of that unit, was calculated from elevation as a measure for suitability for mosquito breeding habitat (Cohen, 2008; Cohen, 2010a;2010b). Suitability for mosquito habitat was also described using remotely sensed imagery (Hay et al., 1998). The normalized difference vegetation index (NDVI) (Rouse Jr et al., 1974) and enhanced vegetation Index (EVI) were calculated from averaged Landsat Enhanced Thematic Mapper (ETM) images from 2010 till 2013 with spatial resolution 100 m. Densely populated areas may face substantially different malaria risks from very sparsely populated, rural areas (Hay et al., 2005). Spatial covariates for malaria receptivity regression. The four significant covariates for the malaria receptivity regression were (A) distance from paved roads, (B) distance from unpaved roads, (C) distance from feeder roads, and (D) distance from Mozambique. All distances were in meters. 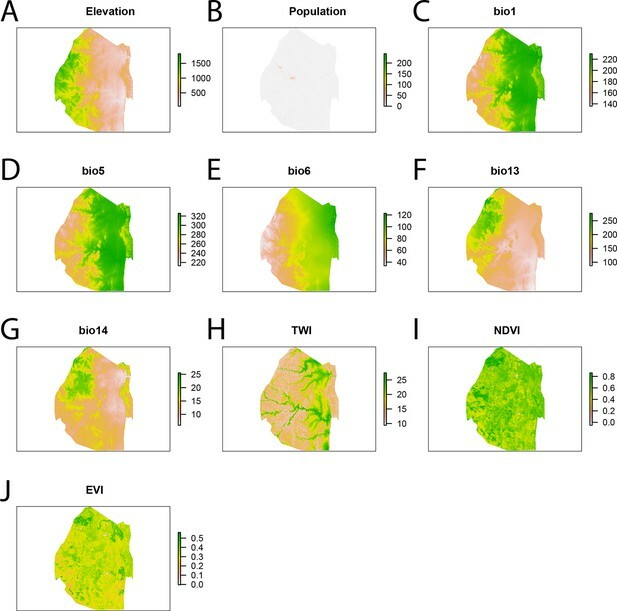 We used spatial zero-inflated negative binomial regression model to extrapolate the number of direct offspring from the cases locations to all points across Swaziland, producing a map of malaria receptivity at 100-meter resolution. For model selection purposes, due to the small total number of covariates for the zero-inflated negative binomial regression (12), we assessed the model fit through AIC for every sub-model (4095 models) and selected the one with the best AIC. The resulting model (Table 1) retained covariates that were not found to be significant, but since we were not interested in the impact of any given covariate, but rather interpolating the observed RC values across Swaziland, backwards selection would have been inappropriate. All analysis was conducted using R, version 3.1.1 (Team RDC, 2011). It is important to note here that there are numerous other models that are ‘almost’ as good as the best. The regression algorithm is a middle step between linking cases together and making operational recommendations. We have not reported all AIC values, and there are other models that give similar AIC values and result in similar maps of receptivity. The particular parameters chosen (and their particular coefficients) are only a step of our algorithm, which would be rerun at any time-point in the future given new data and which would likely result in a different “best” model linking spatial covariates to the output of the first part of our algorithm. Zero-inflated negative binomial regression summary. 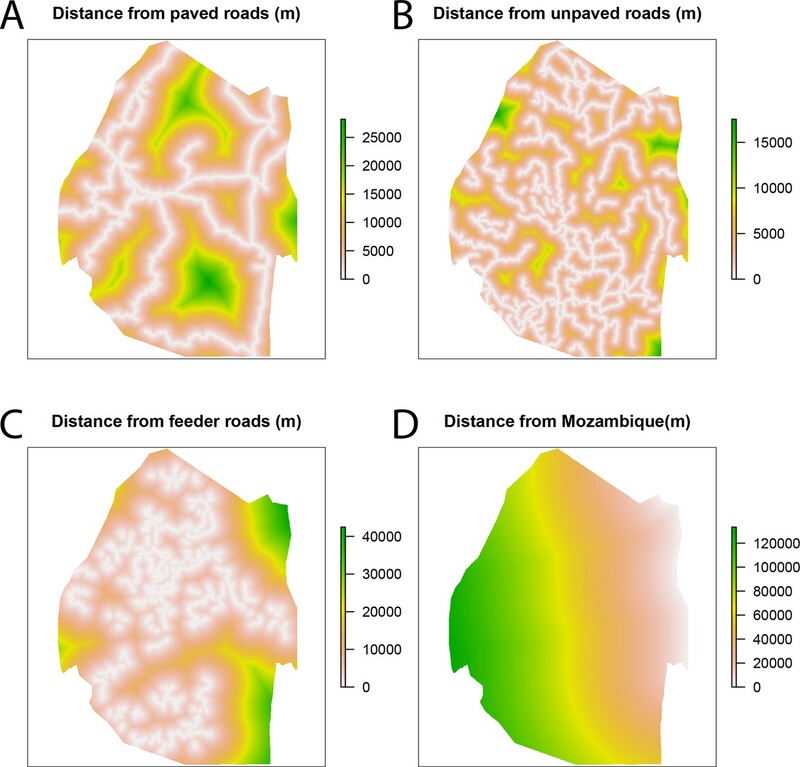 The risk of importing malaria from endemic countries to Swaziland is assumed to be a function of population density, distance to Mozambique and distance to roads (Figure 7). Values for each of the covariates were compared between the locations of the households of patients identified with imported acquired infections and randomly selected “background” points from across Swaziland. Background points do not necessarily indicate the absence of transmission, but instead characterize the environment of the country (Anderson, 2006). A sample of 10,000 background points (Anderson, 2006; Phillips and Dudík, 2008) was selected randomly across Swaziland. The observed importation points as well as the 10,000 background points were combined in a GAM logistic regression (Table 2, Figure 7). GAMs were implemented using the ‘mgcv’ package in R (Wood, 2011) and fit by maximizing the restricted maximum likelihood to reduce bias and over-fitting of the smooth splines. Spatial covariates for malaria importation regression. 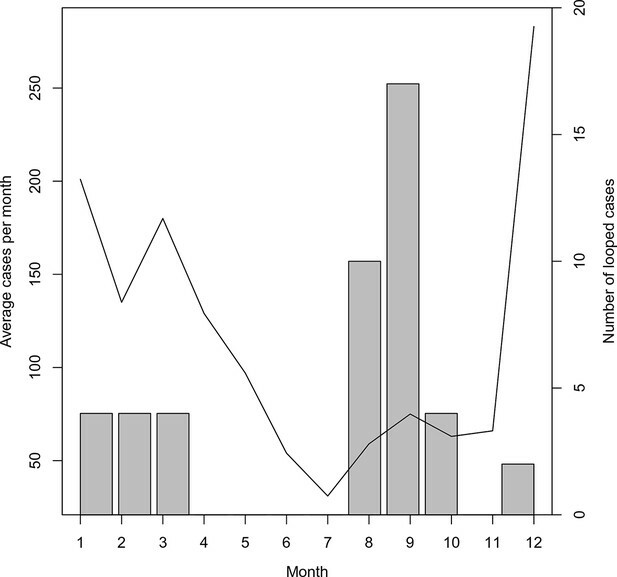 The ten significant covariates for the malaria importation regression were (A) elevation, (B) population, (C) annual mean temperature (bio1 - http://www.worldclim.org/bioclim), (D) maximum temperature of the warmest month (bio5 - http://www.worldclim.org/bioclim), (E) minimum temperature of coldest month (bio6 - http://www.worldclim.org/bioclim), (F) precipitation of the wettest month (bio13 - http://www.worldclim.org/bioclim), (G) precipitation of driest month (bio14 - http://www.worldclim.org/bioclim), (H) TWI, (I) normalized difference vegetation index, and (J) enhanced vegetation index. The relevant concept for malaria transmission in elimination setting was named “vulnerability” by the World Health Organization (WHO) and defined qualitatively as “the frequent influx of infected individuals or groups and/or infective anophelines”; quantitatively, the rate of malaria importation includes all parasites that cross the border in humans and vectors. The impact of vulnerability depends on an area's “receptivity” to malaria which reflects the conditions of transmission “through the abundant presence of vector anophelines and the existence of other ecological and climatic factors”. Receptivity is defined quantitatively as the effective reproduction number RC, which describes the expected number of secondary human infections originating from a single, untreated infected human taking into account vector control measures. The product of the receptivity and vulnerability was named malariogenic potential. The Journal of Infectious Diseases 201:1764–1774. Science (New York, N.Y.) 339:909–910. Science (New York, N.Y.) 344:1230–1232. San Francisco: University of California. American Journal of Epidemiology 158:1039–1047. American Journal of Epidemiology 94:311–315. In: W Wernsdorfer, I McGregor, editors. Principles and Practice of Malaria. Edinburgh: Churchill Livingstone. pp. 1335–1378. Proceedings of the National Academy of Sciences of the United States of America 112:6782–6783. The Lancet. Infectious Diseases 8:369–378. Parasitology Today (Personal Ed.) 14:306–313. 1–81, Malaria Elimination in Zanzibar, UCSF Global Health Sciences, SanFrancisco, CA. Public Health Reports (1896-1970) 70:1057. A Textbook of Malaria Eradication, A Textbook of Malaria Eradication, 2nd edition. Philosophical Transactions of the Royal Society B: Biological Sciences, 368. Frontiers in Ecology and the Environment 3:29–37. Vienna, Austria: the R Foundation for Statistical Computing. Journal of the Royal Statistical Society: Series B (Statistical Methodology) 73:3–36. WHO Expert Committee on Malaria. Thank you for submitting your work entitled "Mapping residual transmission for malaria elimination" for peer review at eLife. Your submission has been favorably evaluated by Prabhat Jha (Senior editor), Mark Jit (Reviewing editor), and two reviewers, one of whom, John Drake, has agreed to reveal his identity. The reviewers and the Reviewing editor agreed that your paper takes a unique approach to modelling malaria transmission – that of linking cases with likely transmission pairs or groups. While similar approaches have been taken with viral respiratory illness (and likely other pathogens that we are not aware of) this appears to be the first application to a vector borne disease. It is sophisticated but not overly complicated and represents an important benchmark on the path to developing better analytics to guide and document the success of malaria elimination programs in sub-Saharan Africa. The analysis appears sound and internally consistent. There are a few issues that we would like you to address, listed below. In addition, we normally require that modelling papers in eLife make their data openly accessible. Please could you tell us of your arrangements for this, or otherwise justify why you are not able to do so. 1) Can any indication of the temporal stability of the map of Rc be given? It is essential to know if the apparently smoldering foci are stable and therefore targets of intervention, or variable and therefore blanket control measures are all that is tractable. 2) We are not clear what view you have of the number of undetected cases or what effect that might have on their map. Presumably it is theoretically possible that all the Rcs are, in fact, several fold higher and case detection frustrates the exercise? 3) How much transmission might be asymptomatic? Swaziland was previously at higher transmission intensity and therefore many adults may be able to tolerate parasitaemia without becoming unwell. 4) When results on pairs of cases are presented in one figure then probabilities are assigned. However elsewhere and in the text the implication is made that a dichotomy has been made between cases that are linked and single cases – how have you moved from continuous probability to a dichotomy? 5) Genetic testing would be a more definitive way of distinguishing linked from unlinked cases. Can you comment on the likely utility of their modelling approach once genetic testing is available? 6) Is the "smoldering transmission" reflective of long-term transmission in the absence of imported cases, or does it require an imported case every so often to keep it smoldering? 7) Fine-grained needs a definition (pixel size? Or is it a point-process with pixelation simply for presentation purposes?). 8) There is a confluent area of high Rc in the North East. In the rest of the country there are occasional dots of high Rc scattered around. What is the possibility that these would have arisen by chance? The model implies very multiple comparisons. If a simulation was carried out where the episodes were randomly distributed through the population then how often would one see a "spike" of red colour in the map just due to chance? 9) If immigrants tend to go to the same places and at the same time (e.g. because they are all being recruited to work in the same factory) then that would increase the likelihood that the two cases would spuriously be associated in time and place despite not having a transmission cycle. Would that source of spurious linkage be accounted for in the migration data that was used? 11) What are the units in Tables 1 and 2? Were data centered and scaled prior to fitting GAMs? In my experience, this sometimes improves performance. […] There are a few issues that we would like you to address, listed below. In addition, we normally require that modelling papers in eLife make their data openly accessible. Please could you tell us of your arrangements for this, or otherwise justify why you are not able to do so. We have repeated our analysis using the first and second halves of the data (before and after July 1, 2012). There are some differences in the Rc maps, but there are also many similarities. One difficulty in interpreting the “stability” of our estimated Rc maps in this low-transmission setting is that in practice Rc will be based on observed cases. We consider the Rc map analogous to a map of where fires may occur if a match was dropped. If you only have a few matches dropped across the landscape, it will be difficult to know which areas are most flammable. We have added these follow-up analyses and some discussion of the results to the manuscript in the “Malariogenic Potential” section. One interesting result of the stability analysis was that in both halves of the data, the max Rc by pixel was considerably higher (35.36 and 3.13 in the first and second half, respectively) as well as the percent of the population living in the highest Rc group. We have added text at the end of the “Occult Local transmission” section to further discuss the impact of undetected cases on our analyses. It is unclear that missing cases would increase Rcs. For example, consider a case (say case A) that appeared to “cause” 2 other cases (say, case B in their village 30 days later and case C in a different village a few km away 45 days later). Case A’s Rc would be estimated as 2. Now, if there was a missing case (say case D) in that other village that occurred 30 days before case C (15 days after case A), then we would say that A “caused” B, D “caused” C and both Rcs (A’s and D’s) would be 1. Missing offspring would result in increased Rcs but missing parents would result in decreased Rc. In response to the previous reviewers’ comment, we added text discussing asymptomatic. One part of this text directly addresses this question. In several circumstances active case detection was conducted around a case to assess the level of transmission and found almost no additional infections (53/7307 in 2014-2015). While this was not done universally, it is consistent with the assumption that there is not a large pool of unreported infections (asymptomatic or otherwise) for every case. We used a threshold to differentiate between unlikely links and spurious associations due to that fact that some case has to be “most likely” even when none are plausible (see “Identifying most likely chains of transmission” section of the Methods, paragraph two, sentence four. We have added text on lines within the main text emphasizing this in the “Mapping Receptivity” section). We have added to our discussion on this topic in the last paragraph of the Discussion to reinforce our belief that even as genetic testing methods improve, our approach will be useful as a baseline. Once a case exists, it enters the algorithm in the exact same way if it is an “imported” case or a “local” case. As such, our model wouldn’t predict that there is need for “new blood” (or a “new strain”). We have added text in the “Mapping Receptivity” section to clarify this point. We have added text at the end of the “Residual Transmission and Elimination” section to clarify. Our algorithm (the case matching algorithm) occurs in continuous space. Our spatial regression that converts observed Rcs into a smoothed Rc map, as well as all other smoothed maps, is a pixel-driven process. Arguably, it too could be conducted at any resolution for which covariate layers exist. This is an excellent question. We are following up these analyses with a statistical analysis of our algorithm using bootstrapping. We have added text in the “Mapping Receptivity” section indicating that assessing how likely it would be to see a “spike” of red due to chance is important to appropriately interpreting these maps for the purpose of resource allocation (resource allocation is the main topic of the follow-up analysis and assessing the signal/noise ratio of these maps is key for that endeavor). This is also tangentially discussed in the “Modeling malaria receptivity” section of the Methods in response to the second half of Comment 10 (see below). A key distinction we now emphasize further is that we are presenting an algorithm to direct operational decisions. The "model selection" procedure for smoothing the calculated Rc values into a map consisted of the comparison of 212-1=4095 models. This approach is most useful when fit using recent data to understand the transmission landscape at that time point. The immigration process you describe would certainly influence the related analysis of “which areas are seeded by which countries”. As far as our analyses are concerned, both of the immigrants you describe would be treated identically. However, they would not link to each other since they would both be considered “imported” cases and imported cases are assumed by our approach to never be caused by other cases. Since they would both be infectious at, for example, the same factory, then they should both “count” the same in terms of our approach. Given the extremely low numbers of cases, accounting for spatial autocorrelation is quite difficult and will be further investigated in our follow-up analysis where we assess the concerns brought up in Comment 8. In response to the second half of this comment, we have added most of the desired details, but emphasized that the exact values found in the “best” model are not the focus of our analysis. Using AIC, we compared 212-1=4095 models. There are numerous other models that are ‘almost’ as good as the best. We have emphasized in the “Modeling malaria receptivity” section of the Methods that our regression algorithm is a middle step between linking cases together and making operational recommendations. We do not think it would be useful to report the 4095 AIC values. Our analysis is about the entire algorithm, which would be rerun at any time-point in the future given new data and which would likely result in a different “best” model linking spatial covariates to the output of the first part of our algorithm. We have added units to Tables 1 for the factors that have units. Table 2 does not display any values that have units. We centered and scaled the data and found the same results. Not only were the effective degrees of freedom essentially identical, but so were the fitted smooths. We have not included this analysis in the manuscript, as we did not think it was critical, but could do so if required. © 2015, Reiner et al.